I just ordered the second edition of this book, which has some add-ons that look interesting. In the meantime, I’ve owned this book for 5 years and it is my first line of defense in fitting patterns and muslins. When I get the 2nd edition, I’ll review the differences between the two. Does this book have clear illustrations or photographs? Yes. The book is chock full of illustrations. In the first half, the Theory section, the illustrations focus on sillhouette, line, body symmetry or asymmetry, measuring, how to recognize distortions, etc. The second half of the book uses copious line drawings to illustrate drag lines on different parts of the body and pattern alterations to address those drag lines. On a scale of 1-10, how would you rate this book in the must-have category? 10, if fitting is your interest and you want a comprehensive book on different ways to achieve fit. What I like about this book: There are a few things worth noting about it. It is written in the style of a college textbook. Two of the authors are instructors at BYU in Utah. But it is written in a way that makes this edition useful for home and hobby sewists. There are tons of clear drawings, showing how to make the changes necessary.This edition concentrates on using commercial patterns, rather than a RTW alteration or pattern drafting approach. They take a holistic approach to fit, too, talking at length about comparing your proportions to those of the pattern, and learning to look beyond the pattern drawing as a way to avoid disappointment in the final garment. How many of us have the proportions of the models or illustrations on the front of patterns? They also discuss color, silhouette, line, ease and other theory staples. 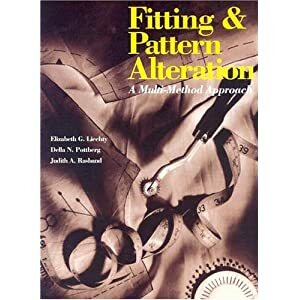 I really like the fact that this book is a “Multi-Method Approach” to pattern alteration. The authors explain how to achieve fit using three comparison fitting methods: pinned pattern, measurement and trial garment or muslin. They go on to talk about different methods for altering patterns: slash, seam and pivot. I like this approach because I have yet to find a single method that works for all pattern adjustments. This gives a good variety, and between the three methods you are likely to find something that works for you. I also like the second section of the book. Using line drawings and detailed explanation, the authors take you step by step from identifying the causes of drag lines through the pattern alterations you should make to address them. They also take many pains to discuss the order of alterations so that you work on the major fit areas first, then work on other areas. It is a logical, well thought approach. Finally, I like the fact that they discuss over-fitting, and how many of us are tempted to eliminate too much ease in order to achieve a better fit. One word of caution: This isn’t necessarily geared to the beginning sewist. This book assumes some knowledge of construction. But it is definitely worth acquiring and you will get your money’s worth from it. Conclusion This is an excellent reference for any sewing library. It’s pricey ($74 list, currently $54 at Amazon). I bought it on a whim at my local Barnes and Noble. It’s become my go-to book for any fit questions. So it has been worth every penny in my opinion.